Century was founded in 1976. Although we were on the small side then – just one man working out of his garage – we’ve since grown into the worldwide leader in martial arts equipment. 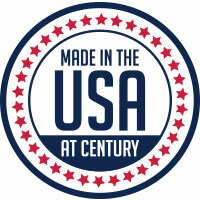 Along the way, Century has been responsible for some major innovations within the industry. 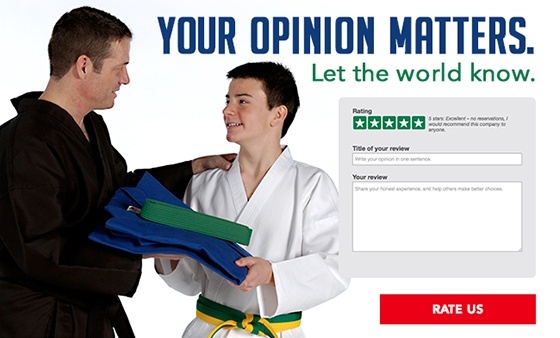 We were one of the first martial arts companies to create a website, allowing our customers to easily place orders and access digital resources. Century has also designed some of the best known and most iconic pieces of martial arts gear, like the Wavemaster®, the original freestanding training bag, and the BOB® body opponent bag. BOB® bags frequently pop up in TV shows and movies, including ‘The Office,’ ‘Deadpool,’ ‘Justified,’ ‘Horrible Bosses,’ ‘Parks and Rec,’ ‘Whiskey Tango Foxtrot,’ and ‘Elementary,’ to name just a few! One of the reasons why Century is so passionate about what we do is that many of our employees are themselves martial artists. Our founder, Mike Dillard, won two Karate National Championships during his time as a competitor. Some Century employees own or instruct at martial arts schools, or spend their after-work hours and weekends competing and training. In 2005, Century took its employee involvement with martial arts a step further and converted two rooms in the company headquarters into training studios. Employees in the Century Martial Arts Club can take martial arts classes during lunch or after work, and, with certified instructors, actually advance and gain belt ranks. This is especially significant to us, as Century makes most of the belts we sell on-site, in our Oklahoma City headquarters. Because we train, we understand what it means to earn a belt. We put the same pride and commitment into making them as you do wearing them. Our showroom is located at our headquarters, in Oklahoma City, OK. It’s a great place to shop for your martial arts gear if you live nearby. If you place an order over the phone, you can request to pick it up at the showroom. Your order will be ready for you to come pick up within 24 hours! We proudly stand behind everything we sell and therefore we have a 100% Satisfaction Guarantee. If you are not completely satisfied you can return unused products for a replacement or refund within 30 days of purchase –with no restocking fees, unlike some of our competitors. All Century products are warranted to be free from defects in materials and workmanship for 90 days. No matter your martial art, whether you’re a black belt instructor, a first time student, or a fitness enthusiast looking for equipment to put in your home gym, Century has what you need. We have over 11,000 unique SKUs – you can find products from kettlebells to kendo armor! Plus, Century has many great customization options for both schools and individuals. Need your school’s logo on several dozen bags? No problem! Custom stripe colors on your belt? Sure! A belt display with your child’s name engraved on it? We can do that! We price competitively, so you know you’re getting quality gear at a good price. 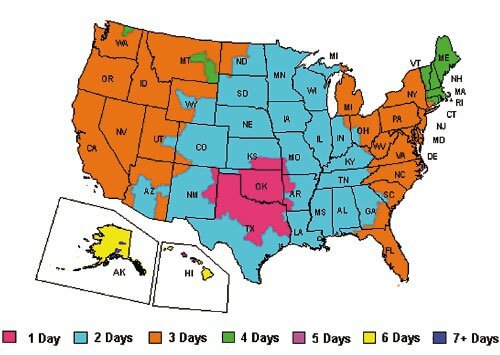 We offer same-day shipping on all orders placed before 3 p.m. CST. We have a huge inventory stocked in our Oklahoma City warehouse, so you can see where your items are coming from. The chart below shows approximately how quickly your order will get to you. 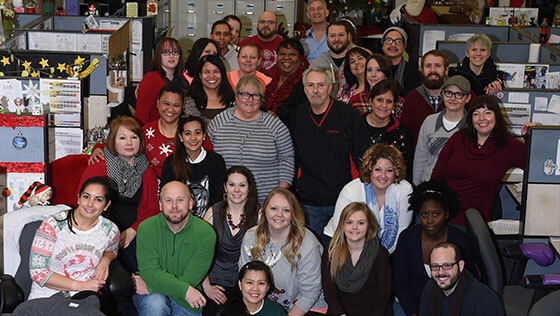 Our experienced, friendly customer service team prides itself at being reliable and courteous. Representatives are available on-call six days a week, and you can correspond with a rep or leave a message on our website’s Live Chat. 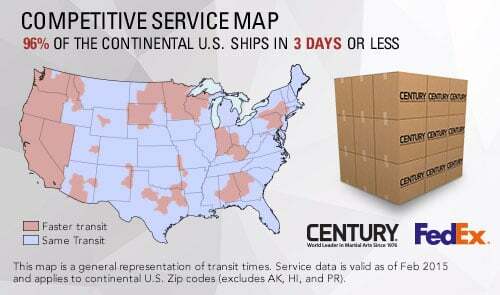 For more information on contacting Century Customer Service, click here. Unlike some other companies that simply reuse old designs or resell imported inventory, Century has its own Research and Development team. Our R&D team work at the company headquarters, brainstorming and designing new products. 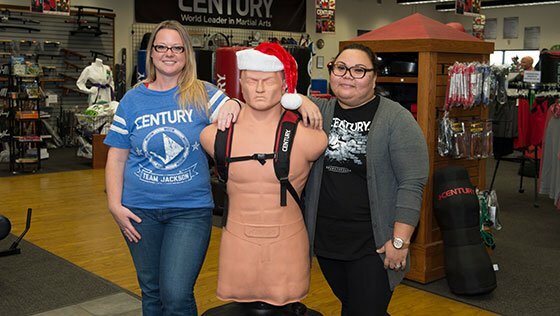 Thanks to them, Century has stayed on the cutting edge of martial arts gear, with major innovations like the original freestanding Wavemaster® bag, BOB® body opponent bag, and the Versys™ line of fight simulators. In 2001, Century created the Martial Arts Industry Association, or MAIA, in order to help grow schools and promote martial arts. Our company founder, Mike Dillard, believed that martial arts could change lives and communities for the better. He made it a priority to found MAIA, an organization that helps to spread martial arts by supporting the schools that teach them. MAIA consultants act as business and legal advisors for member schools, and the website provides other resources including lesson plans for classes, and community resources. Century and MAIA cohost the annual Martial Arts SuperShow, the industry’s largest trade show and learning event. If you’ve watched UFC fights, chances are you’re already familiar with Century products. 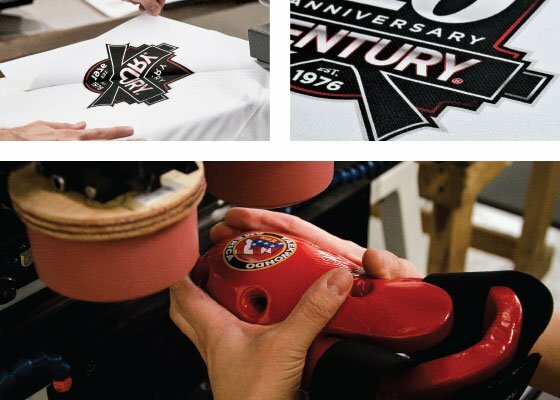 In 2006, Century partnered with the UFC® and became their producer of branded fight gear—including the official gloves worn in the Octagon®. Century teamed up with MMA coaches Greg Jackson and Mike Winkeljohn to work on product testing and innovation. Their fighters test Century products and give us even more, outside feedback. Three years later, we approached Brazilian Jiu-Jitsu legend and American Top Team cofounder Ricardo Liborio about a collaborative venture. Century became his official equipment and apparel provider, and we worked closely with him to design and create the ’96 Especial Gi, named in honor of his 1996 victory in the IBJJF Championships. In 2015 we partnered with Team Paul Mitchell, the longest-running sport karate team consisting of the highest level athletes from all over the world. Over the years Century has also worked with TapouT®, Adidas®, PHIT (Personal Heath Investment Today) America, and the IMMAF (International Mixed Martial Arts Federation), as well as dozens of individual martial artists. We enjoy getting to work with the broad array of talented individuals. At Century, we’re committed to promoting martial arts and one of the best ways we can do that is through collaboration with the coaches, competitors, and other individuals who are making a difference in the martial arts community. The Martial Arts SuperShow, sponsored and cohosted by Century Martial Arts and MAIA, is held once a year and is the largest industry event. Thousands of school owners and instructors have attended the trade show and business seminars at the SuperShow, and successfully used what they learned there to improve their schools. At the SuperShow, alongside business big-names you’ll find martial arts legends, like Bill “Superfoot” Wallace, Ricardo Liborio, Ernie Reyes Sr. and Jr., and so many more. Physical training seminars give attendees the chance to train alongside their martial arts heroes. School owners will want to take advantage of all the great custom options Century offers on many of our products. We can engrave, embroider or screen print everything from uniforms and sparring gear, to backpacks, display cases, T-shirts and more! Selling custom products can provide big benefits to your school – establishing a strong brand helps you stand out and make you a recognizable marketing presence. We’ll even work with you to create a logo if you don’t already have one! We offer many custom products, including T-shirts, sparring gear, and bags. With sublimation printing, screen printing, engraving and embroidery customization options, you can ensure that your school’s logo and colors are prominently displayed anywhere you or your students go. Contact a Century Representative to learn more about customization options. As a wholesale customer, you can get a free subscription to our maSuccess magazine. The magazine, published by MAIA (Martial Arts Industry Association) features business columns and advice for martial arts school owners, as well as feature articles on interesting people in the industry. 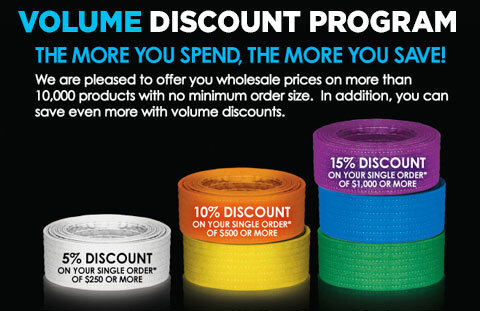 Along with maSuccess, wholesale customers also receive our monthly Update with special deals and discounts. If you’re not a wholesale customer yet but you’d like to become one, fill out our application here. Once you’re a member, you can be considered for joining our Facebook group for wholesale members, the Century Martial Arts School Network.